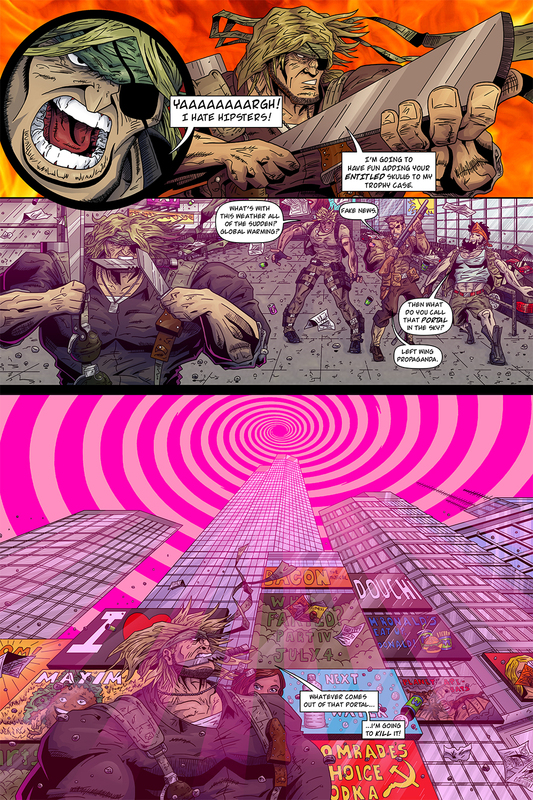 Just when Team Stryker is ready to tear the new Hip Squad apart a giant portal opens up in the sky! Almost all the pieces are in place for us to have the most epic issue of Team Stryker yet! I’m very excited for what’s coming next for Team Stryker as this issue unfolds. It’s taking me a little longer per page, but I really hope that this is the issue that puts Team Stryker on the map and is the must own issue of every Team Stryker fan. The next update will be a two page spread so it will take me a little bit longer to get that one completed. As soon as it’s done it will be posted here. Until then be sure to follow me and Team Stryker on Facebook, Twitter and Instagram @TSComic. I’m currently working on some one of a kind Team Stryker Volume 001 Hardcover commissions for the Calgary Expo next month. I’ll be posting all of those there so be sure to message me if you plan on coming to the expo and want an exclusive Volume 001 hardcover book with a custom commission in it.